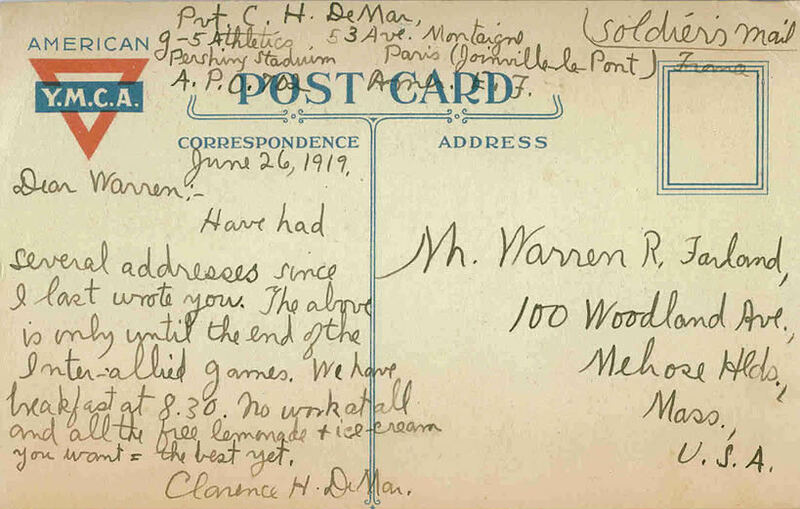 Recently a collector discovered a wonderful piece of running memorabilia, a postcard written by Clarence H. DeMar, the only seven time winner of the Boston Marathon. Clarence H. DeMar has always been portrayed as an unfriendly, stern, tough as nails competitor. When Johnny A. Kelley (the elder) won his first Boston Marathon in 1935, he tells of DeMar shrugging off his victory by saying, "Well, I guess we've got your win out of the way." Jessie Kelley, the wife of John J. Kelley (the younger), jokingly says that she was afraid DeMar, "I'd hide in the corner whenever he was in the room." 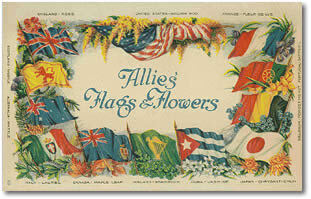 This postcard, handwritten by DeMar, offers a glimpse of his personality, his sense of humor, and his "Yankee" economy of words. DeMar was serving as a Private in the U.S. Army in 1919. The year before he had been rejected by the Navy because of poor distance vision, but then he was drafted by the Army and was stationed first in England, then France. World War I had just ended so DeMar did not see any combat, in fact he said he never even learned how to shoot! 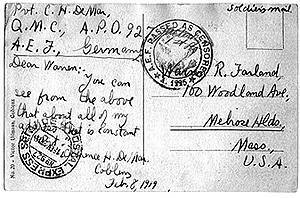 In February of 1919 DeMar was transferred from St. Armand, France to Coblenz, Germany where he joined the Army of the Occupation. He wrote a friend about the move, sending him the postcard below. The card is addressed to Warren R. Farland, 100 Woodland Ave., Melrose Hlds., Mass., U.S.A. and is dated February 8, 1919. It was sent via "Soldier's Mail," and cleared by the military censor. Dear Warren: You can see from the above that about all of my address that is constant is "Pvt." Demar signed this card twice, the second time in the return address. As part of the Army of the Occupation DeMar had little to do in France. The war was over and Great Britain, France and the US were in negotiations as to how a defeated Germany should be treated. 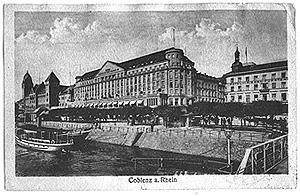 Still stationed in Coblenz DeMar had competed in the trials for the Inter-Allied Games in Paris a few weeks earlier, finishing fourth in the 10 mile run. This qualified him as a sub for the American team, he was awarded a uniform but he wouldn't be allowed to compete. He returned to Paris for the games and did march in the opening ceremonies. 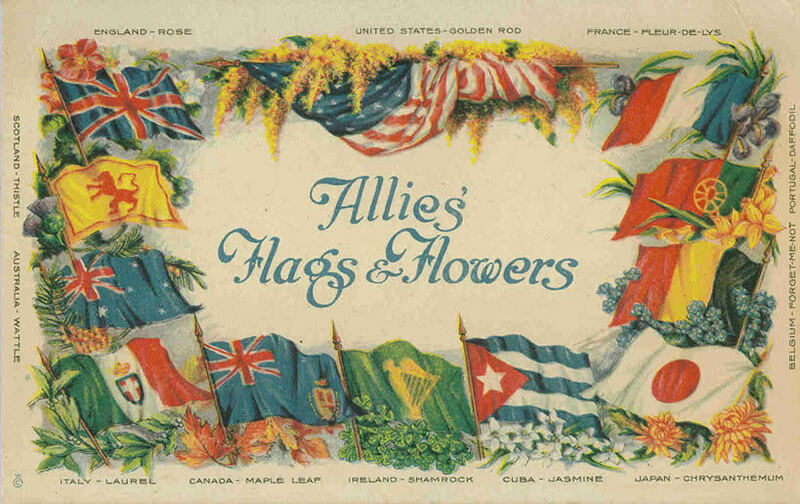 Two days after he sent this postcard from Paris the Treaty of Versailles was signed, formally ending World War I and sowing the seeds for World War II. 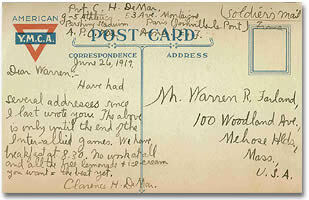 The card is addressed to Warren R. Farland, 100 Woodland Ave., Melrose Hlds., Mass., U.S.A. and is dated June 26, 1919. It was sent via "Soldier's Mail." Dear Warren: Have had several addresses since I last wrote you. The above is only until the end of the Inter-Allied Games. We have breakfast at 8:30. No work at all and all the free lemonade + ice cream you want = the best yet. The best part of collecting is unearthing true gems with historical value. These rare cards leap back through the years. They place the reader in DeMar's Army barracks, filling an idle moment by touching base with a friend, and sharing a laugh at his situation. This is not an example of the cold demeanor of a steely-eyed marathoner, it's a welcome view of the human side of the man. Clarence H. DeMar (1889-1958) Seven time winner of the Boston Marathon, he won in 1911, 1922, 1923, 1924, 1927, 1928, and 1930. He represented the United States in three Olympic Games, 1912, 1924 and 1928.